SILVER SPRING, Md., March 21, 2019 /3BL Media/ – Stanley Black & Decker, the world's largest tools and storage company and leader in engineered fastening and security, and Discovery Education, the leading provider of standards-aligned digital curriculum resources, engaging content and professional learning for K-12 classrooms, today announced Innovation Generation: Making an Impact’s inaugural Concept and Create Virtual Field Trip. Nationwide, the digitally immersive experience is scheduled to premiere on Thursday, March 28, 2019 at 1:00 p.m. ET from Stanley Black & Decker’s Makerspace based in Towson, Md. The Concept and Create Virtual Field Trip experience will transport students across the country beyond the walls of their classrooms, into Stanley Black & Decker’s Makerspace, where they will learn science, technology, engineering, arts and math (STEAM) concepts from industry experts – including how teamwork can lead to technological advancements. 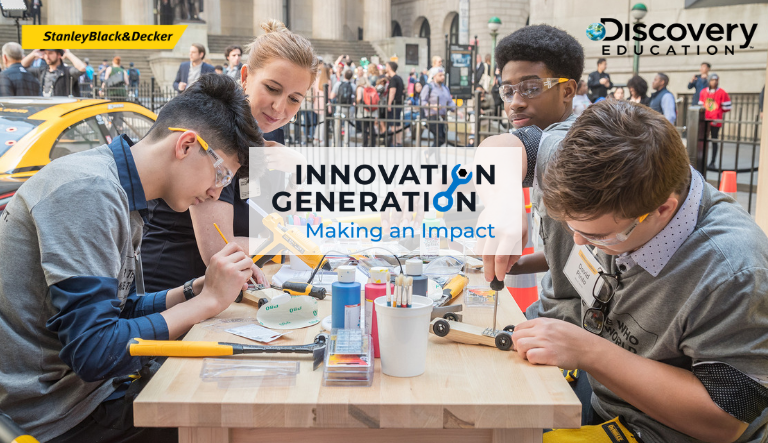 Viewers are encouraged to register for the event, and join @DiscoveryEd and @StanleyBlkDeckr for a LIVE Concept and Create Virtual Field Trip Twitter chat using the hashtag #InnovationGenVFT. The Virtual Field Trip is part of Innovation Generation: Making an Impact, an initiative aimed to inspire educators and students in grades 6-10 to explore the innovation continuum. Powered by Stanley Black & Decker’s tools, including leading brands such as DEWALT, CRAFTSMAN, STANLEY, IRWIN and BLACK+DECKER, together with Discovery Education’s unparalleled classroom reach, Innovation Generation: Making an Impact fuels student learning and inspires the maker spirit within us all. Innovation Generation: Making an Impact complements Stanley Black & Decker’s existing maker-focused efforts, which include Makerspace collaboration initiatives with universities and other organizations, global apprenticeship programs, sponsorship of WorldSkills International, and the company's Manufactory 4.0 initiative – an effort that encompasses job retraining efforts. Stanley Black & Decker also runs the STANLEY+Techstars Additive Manufacturing Accelerator program.